Gauging Dust Straight Through the Milky Way: First Results of Photometry of Galaxies in the Z.O.A. Accepted for publication in Astronomy & Astrophysics in October 2002.
while a version with figures in jpeg format can be found in the astro-ph archive: astro-ph/0210270. Accepted for publication in Astrophysical Journal in October 2002.
while a version with color figures in jpeg format can be found in the astro-ph archive: astro-ph/0210510. Accepted for publication in Astrophysical Journal in January 2003.
while a version with color figures in jpeg format can be found in the astro-ph archive: astro-ph/0301105. To be published in: Galaxy Evolution in Groups and Clusters, Eds. C. Lobo, M. Serote Loos, A. Biviano. Pub: Kluwer (2003) Astrophys. & Space Science Ser. also available in the astro-ph archive: astro-ph/0301108. in Porto, September 2th - 7th, 2002 (also available in jpeg format). 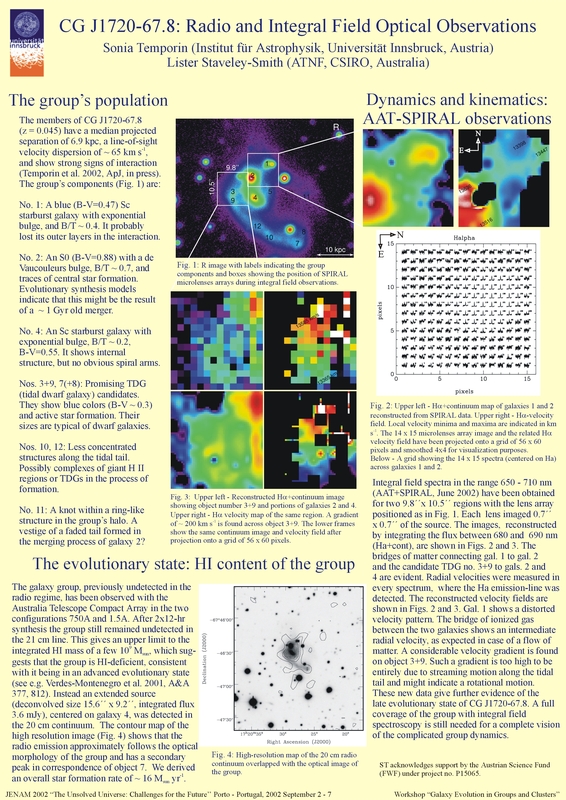 Poster presented at the conference "Starbursts: from 30 Doradus to Lyman break galaxies"
held at the Institute of Astronomy Cambridge, UK, September 6th - 10th, 2004.
eds. R. de Grijs and R. M. González Delgado. The poster itself is available as a pdf file here, while the poster-paper can be found here (gzipped ps file).